I remember that day back in late January when I had planned to watch the live stream of the ALA Youth Media Awards with my sixth graders, but as fate would have it, we had a snow day that day. I sat there in my home office in my pajamas, all by myself, waiting for the winners to be announced. 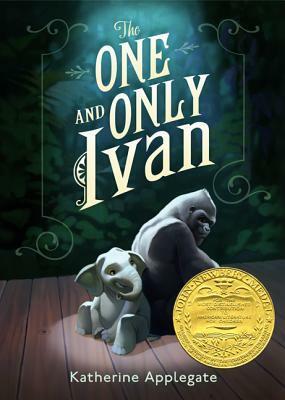 When The One and Only Ivan was announced as the winner of the Newbery award, I screamed and then I wept. 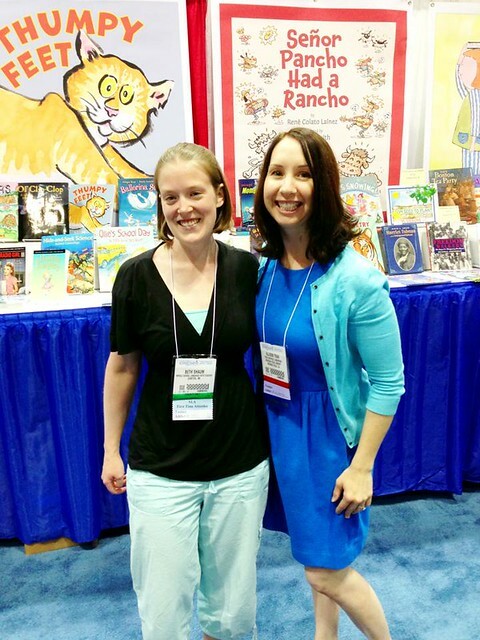 Before I even tweeted my congratulations to Katherine Applegate, I immediately tweeted my friend Colby Sharp, who had ardently championed the cause for Ivan to win the Newbery with great zeal. 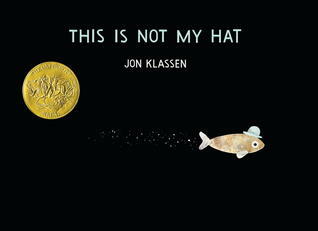 And not only did Ivan win the Newbery, but another favorite among Nerdy Book Club friends, This Is Not My Hat, won the Caldecott award. I couldn't believe that the books that so many Nerdy Book Club members loved and had ebulliently recommended to others had won the two most coveted awards in children's literature. four hour drive from my house in Michigan, I knew I, along with many of my other Nerdy Book Club friends, just had to be there. My whirlwind trip began on Friday when I drove into Chicago just as the Blackhawks victory celebration was dying down, so luckily the traffic wasn't too horrible. 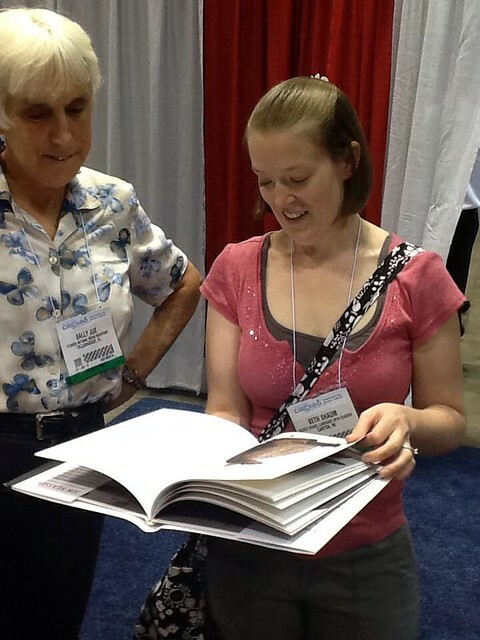 My roommate, Alyson Beecher, and I decided to head over to McCormick Place to get our registration materials and then go to the exhibit hall that was opening at 5:30. The exhibit hall was CRAZY. It was so packed that it honestly felt more like we were cattle being herded than people looking to get books. It was there, however, in that crowded exhibit hall, that I ran into Allison Tran, someone I have known through various online spaces for the past ten years and whom I only just met face to face at that moment. You don't even know how excited I was to finally meet her in person and to realize that she is just as sweet as she is on Twitter and Facebook. After the exhibit hall, Alyson and I took a cab to Epic, a restaurant downtown where the Walden Pond Press party was being held. 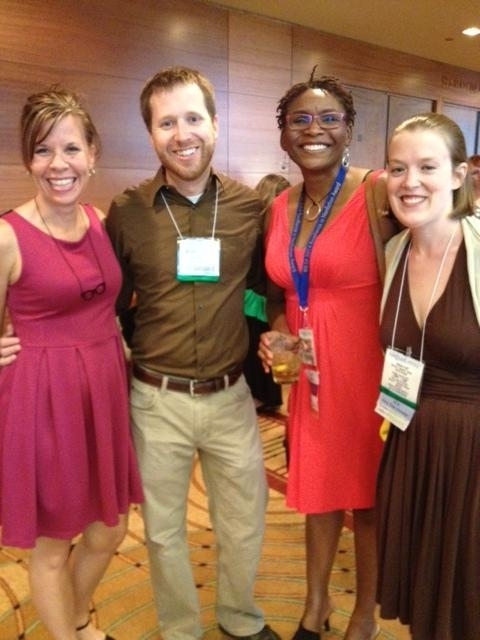 It was there that I got to catch up a little bit with some more of my Nerdy Book Club friends and also meet some tweeps that I had never met in person like Kathy Burnette and Jennifer Reed. I was also able to talk to Allison more since she was also at the party. Thanks Kellie Celia for hosting such an "Epic" party. I had a wonderful time! 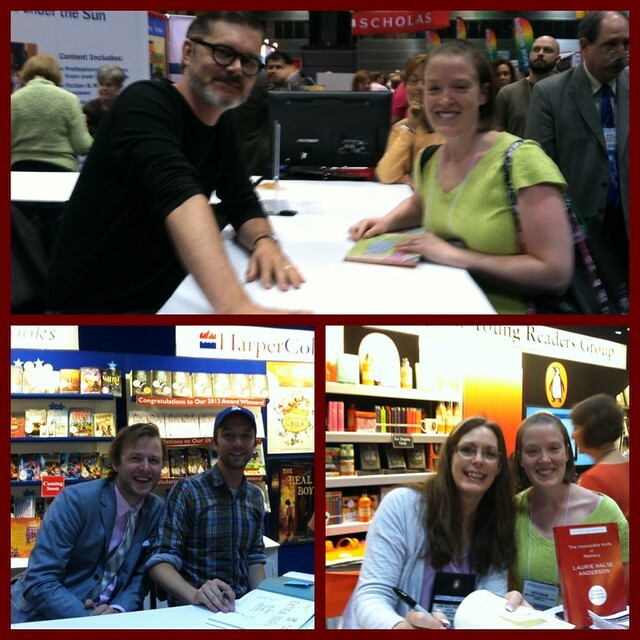 On Saturday I hung out in the exhibit hall for most of the morning and afternoon where I met and talked to authors like Mo Willems and Laurie Halse Anderson (well, "talk" to Mo Willems is a bit ambitious to say given that his line snaked for what seemed like miles and you could only get one book signed with no personalizing), and left with a giant bag of books. Then later that evening Katherine Sokolowski and I took a cab to Hyde Park where the incredibly lovely and gracious Elizabeth Fama, author of Monstrous Beauty, was having a party at her house. I don't even know how to describe this party. It was the most lovely party I've ever been to. Beth's house was inviting and warm, the food was phenomenal -- made in large part by her incredibly talented and artistic children -- and there was a laid-back, comfortable feeling to the whole evening I never would have imagined given the fact that most of us were going to this generous woman's house and she had never even met us in person. That is the power of Twitter, y'all. So many people say that social media is making us less social because we feel like we don't have to interact face to face anymore, but I'm finding the opposite is true. I have formed so many friendships and I go out more now than I ever did before I had Facebook and Twitter accounts. I mean, the very word party used to send shivers down my spine. As an introvert, the idea of having to insert myself into a conversation and make small talk just made me want to go home and read a book in my pajamas instead. But now I'm surrounding myself with people I've already gotten to know online and who I know love books. So there's no awkward conversation because we're all book people. Thank you Elizabeth Fama for your hospitality and generosity at opening your home to people you barely knew. The only thing you knew about us was that we were book people, and to you that was good enough. When we got to the front of the line, I was completely floored and blown away when Katherine saw me, recognized me, and gave me a hug. My year was made in that moment right there. 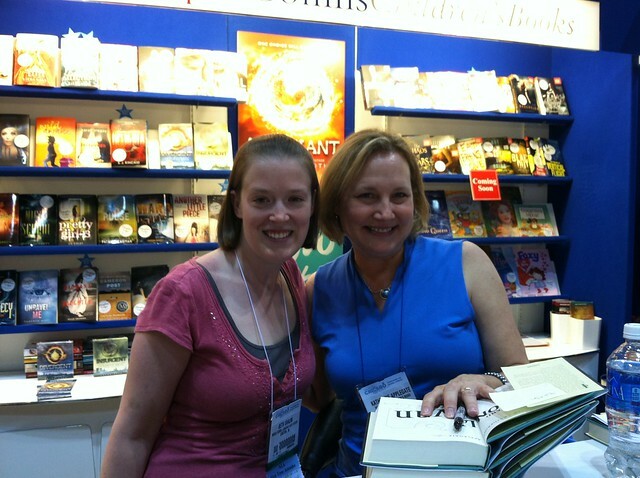 I couldn't believe that the Newbery winning author of 2013 knew my name and gave me a hug. I also met Benjamin Alire Saenz, author Aristotle and Dante Discover the Secrets of the Universe. This book won THREE ALA Youth Media Awards in January: a Printz Honor, the Stonewall Award, and the Pura Belpre Award. With that many awards, book lovers who had never read it were scrambling to get their hands on a copy - I was one of them. It was such a beautiful story and such an important story, that I actually found myself unable to speak when I made it to the front of the line to get my book signed. I tried to tell Benjamin what a beautiful book it was, but ended up choking back tears instead. I felt like such an idiot. 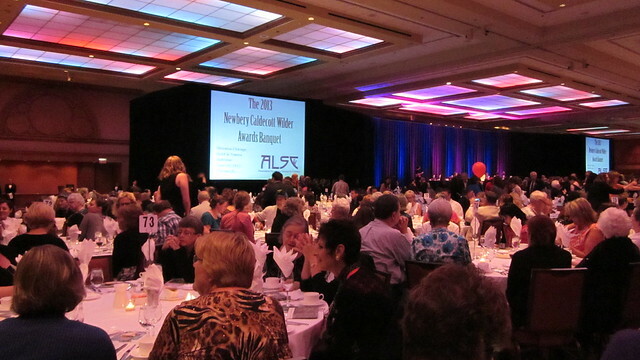 Later that evening, we all got dolled up and went to the event we had all been waiting for since that fateful day in January when the ALA awards were announced: the Newbery Caldecott banquet. I'm still trying to find the appropriate words to describe the evening. Author Laura Golden probably said it best when she wrote on her blog: "The evening was filled with fairytale magic." 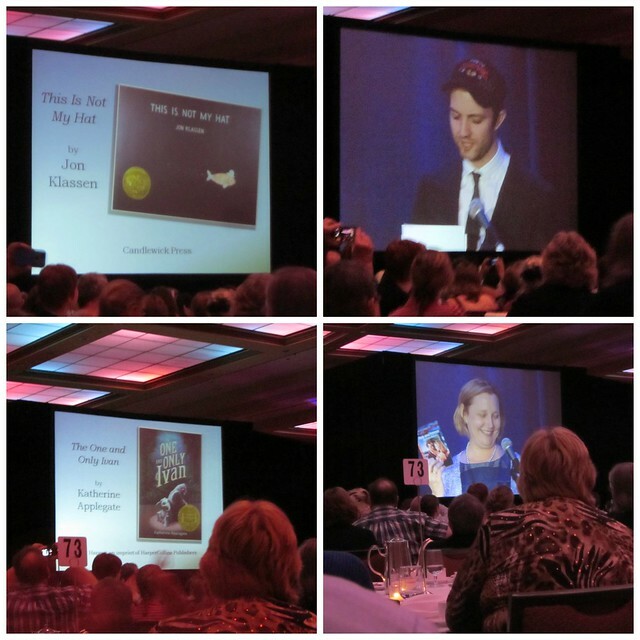 Not only did the books that we had rooted for win the most coveted awards in children's literature, but the speeches that accompanied these awards were magical as well. choked back tears while thanking the people who made the award possible, and called his books "my little guys." He even surprised us all when he said his inspiration for This is Not My Hat was a "little-known story called 'The Telltale Heart'" by Edgar Allan Poe. But then as he explained it, everything made sense. Just as in "The Telltale Heart", the little fish in This Is Not My Hat has done something wrong and "he's given the whole floor... to try to make an argument for his reasonableness and sanity by telling us his version of how things went down," and then ultimately succumbs to his crime. Now that I know what inspired This Is Not My Hat, I'm going to be using this as further argument that picture books are not just for elementary students: high school and middle school teachers should be using them in their classrooms too. I mean, how much fun would it be to give kids an assignment to compare "The Telltale Heart" with This Is Not My Hat? 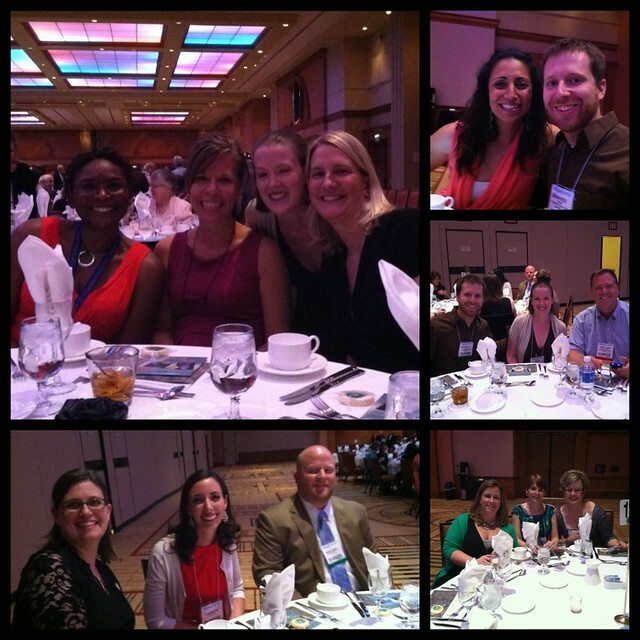 Katherine Applegate's speech was just as gracious, humorous, and heartfelt as you would expect it to be. She began her speech by informing the audience that she is probably the only Newbery medalist in history to have written Harlequin romance novels early in her career - and then proceeded to read to us a particularly painful (and yet hilarious) passage. "I learned that writing is excruciating and I learned that writing is exhilarating." "I ghosted so much I was positively ectoplasmic." "It's quite fair to say that it took me a while to locate my literary sea legs." When Katherine thanked Colby Sharp, John Schu, and the Nerdy Book Club, I think we all wanted to scream, but we held back because it was just too dignified of an event for hooting and hollering. 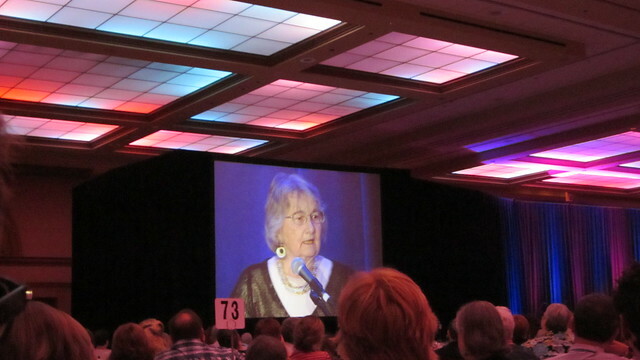 And finally, the last speech of the evening was Katherine Paterson who won the Laura Ingalls Wilder award which, according to ALA's website, "honors an author or illustrator whose books, published in the United States, have made, over a period of years, a substantial and lasting contribution to literature for children." It shocks and surprises me that Paterson is only just now winning this award as her presence in the children's lit world has been "substantial and lasting" for many years now. In fact, as the chair of the Wilder committee introduced her, they even joked that the reason she hadn't won the award yet is because everyone thought that surely she had already won it. Her speech, like Klassen's and Applegate's, was absolutely perfect. It was humorous and endearing, and made tears stream down everyone's face. I spent the whole evening clinging to my tissues. It was, to paraphrase Laura Golden, simply magical. I am so grateful that I not only got to be part of this evening, but that I was able to share it with my book loving friends. The stars aligned perfectly for this night to happen. It really was the opportunity of a lifetime. Your excitement just comes right through this post! What a great opportunity. Sounds like a fun time! And you're right, I would have imagined that Katherine Paterson had won before ... countless times! 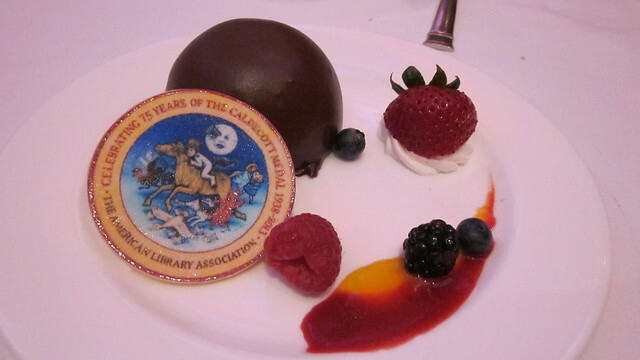 I got chills reading about your Newbery Caldecott banquet experience. How wonderful-- and I am blown away that This Is Not My Hat is inspired by The Telltale Heart. I totally agree with you that it would be great in a lesson plan, and now I'm even more inspired than ever to make a book display of picture books that adults will appreciate. Love it! Beth - Great recap! I heard Benjamin Alire Sáenz give his Printz speech. He was so genuine and heartfelt in what he had to say that the audience was all teary eyed and he was the only one to get a standing ovation that evening. It was great rooming with you. Hi there - Discovered this through a retweet of a retweet on Twitter, and just wanted to say how much I enjoyed this post and your enthusiasm for the books. 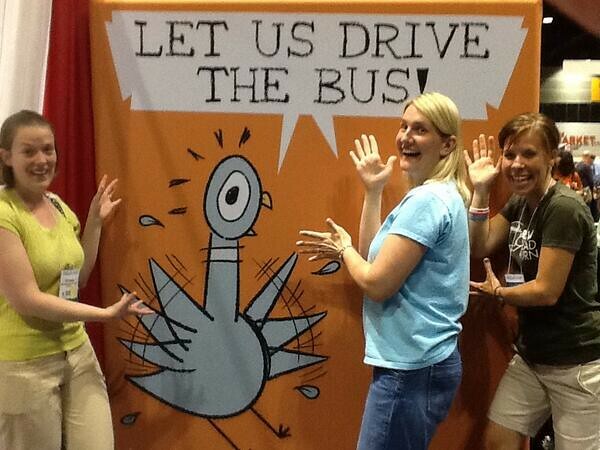 Wish I could have been there to hear those author speeches; thank you for including the quotes from them! I just recently discovered the magic of "The One and Only Ivan," and am now going to get "That Is Not My Hat." Love the story of the secret inspiration for that. Thanks again for this! I love this post! What an amazing trip/experience. I struggle sometimes to come up with gift suggestions to give to my ILs for my kids, but I have some now, thanks to this post.